Looking down on the Evolution of Tradition exhibition showing Edward’s Splash coffee table, Radiant desk and Chichester Tables. 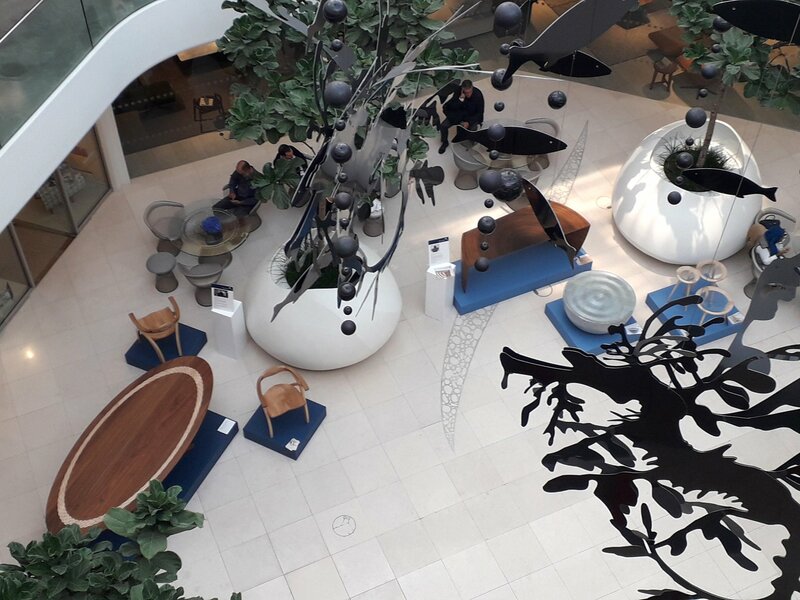 In October, Edward participated in the Evolution of Tradition exhibition held at the Design Centre Chelsea Harbour, London showing his Splash coffee table, Radiant desk and Chichester Tables. 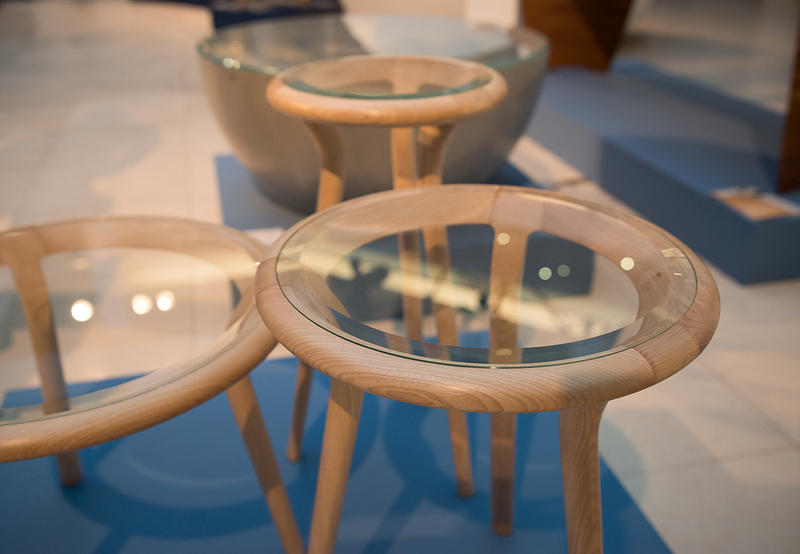 The exhibition was a new initiative bringing together a selection of the very best contemporary bespoke furniture designer-makers in the UK. The exhibition was a collaboration between The Furniture Makers’ Company and the Design Centre and included an impressive rollcall of established designers and new talent from the vibrant British craft scene, such as: Tim Gosling, John Makepeace OBE, Matthew Burt, Marc Fish, Alun Heslop, Rupert McBain, Laurent Peacock, Jake Phipps, Angus Ross, Rupert Senior, Katie Walker and Waywood, and of course our very own Edward Johnson! What made this selection of designer-makers very special is that they all have one thing in common: they all hold at least one prestigious Bespoke Guild Mark awarded by The Worshipful Company of Furniture Makers. To be awarded a Bespoke Guild Mark each designer-maker not only needs to demonstrate the highest quality in craftsmanship, but also show innovation and excellence in design. Every piece of furniture awarded a Bespoke Guild Mark has been inspected and scrutinised by some of the leading industry professionals. Every minute detail is taken into consideration with the principal requirements being that the design and craftsmanship are both equally exceptional. A Bespoke Guild Mark ‘rewards excellence in design, materials, craftsmanship and function for pieces [of furniture] made as single items or a limited run of up to 12.’ Only 471 Bespoke Guild Marks have been awarded by The Worshipful Company of Furniture Makers to date, formed as a Guild in 1952. We are very proud to say Edward has three! The first for his Perpetual Bloom dining table at the age of 26, and then subsequently for his Orbis drinks cabinet and Bog Oak Ripples chest. Edward has recently been invited onto the Bespoke Guild Mark committee and hopes to help spread the word about this very prestigious and unique award. This month the Furniture & Cabinetmaking magazine has featured an article on the Evolution of Tradition exhibition including Edward’s Radiant desk, you can read it here.